Pioneer Solutions brings you their newest mPOS the Dash T3. 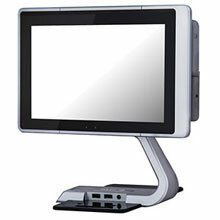 The T3 is a 10.1" Windows Tablet PC, designed to provide portability and mobility in many vertical applications. The UP base allows the T3 to be rotated to either a landscape or a portrait view, to meet the application's requirement. It also allows the T3 to be tilted backwards to face the customers. The UP base comes with 2 USB ports to support additional devices such as printer, barcode scanner, or customer display. The Pioneer T3-C123V5-42 is also known as PioneerPOS	PIN-T3C123V542	or T3C123V542	.